No class of garden plants adds so materially to the colorfulness and diversity of the flower garden as perennial flower plants. Perennials gardens are extremely diversified in general character and appearance; they accommodate themselves by their various growths and habits to any plant garden situation; and some are in their pride of beauty throughout the year. Almost every shade of color is to be found amongst perennial plants and bulbs for sale at direct gardening. Today professional landscape designers, architects, and contractors can go mobile in explaining their design plans with perennial plants by using a professional landscape app. Landscape design apps allow users to visualize and then create a design from scratch on the iPad using a photo taken with the tablet’s camera. 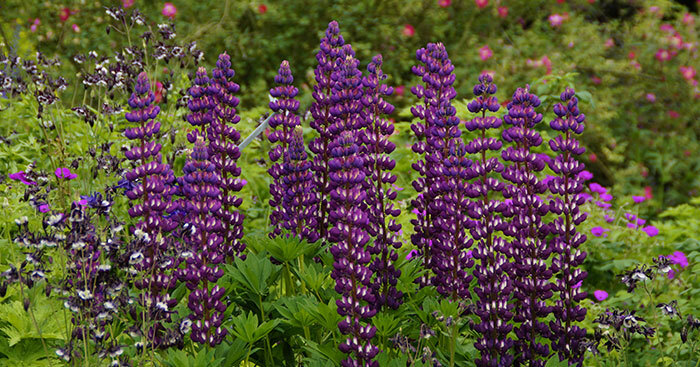 Perennial flower plants possess the advantage over annuals in that each succeeding spring sees the perennial revive in equal, and in many instances, even with an increased splendor. Perennials are principally plants which remain several years in the ground without requiring to be taken up and replanted; flowering every summer, and generally dying down to the ground in winter, but when they do so, springing up again from the root in spring. These plants are seldom raised from seed, and when they are, they do not flower till the second or third year; but they are generally propagated by dividing the roots either in autumn, when the perennial plants have done flowering and are in a state of repose, or in spring, just before the young shoots begin to grow. Perennials afford a great variety of form, foliage, and flower, and compared with annual plants, they are found to be much less trouble. If a right selection is made and properly planted, at times the plants may be relied upon to appear with perennial vigor and produce flowers more or less throughout the year. It is not said that bouquets may be gathered in the depth of winter, but what can be equally cheering may be had in Bluet, Violet, Primrose, Christmas Rose, Crocus, Hepatica, Squills, Snowdrops, and other less known perennial flower winter bloomers. It does not seem to be generally understood that warm nooks and corners, under trees or walls, serve to produce at times winter flowers which usually appear in spring. Hardy perennial flower roots may be generally considered under two heads; those having bulbous roots, and those of a fibrose character, which is by far the most numerous division. The bulbous root perrenials should be transplanted during the autumnal months, while the fibrose may be removed with safety from Fall to Spring. At times, a large collection is constantly kept in pots, for the convenience of safe removal at any part of the year. When a Perennial plant is increased by division, it is not necessary to take up the whole plant, but a portion of it may be divided by the spade; or the earth may be cleared away from the roots on one side, and a portion separated from the principal mass with a gardener's knife. The principal points to be attended to in both cases are to have several buds attached to the portion of the root which is removed; to divide the part taken away from that which remains by a clean cut, so as not to leave a bruised or ragged portion of either stem or root; and to take up the whole of the fibrous roots of the part removed, to their full extent, as the spongioles, through which alone the plant can take up food, are at the extreme point of the fibrous roots, and if they are broken off, the plant will suffer considerably, from its being forced to exist without food till it can form new ones. If, on the contrary, the portion removed be taken up carefully, with all its roots and their spongioles uninjured, and planted in a suitable soil, it will grow rapidly; and its flowering will not be at all checked by its removal. Many gardens are very small, but perennials, if properly managed, have their advantages. The smaller the garden the more choice should be the collection, and the more highly cultivated. Create the perfect Victorian outdoor garden by planting favorite nineteenth century perrenials, sometimes called "old-fashioned flowers." Perennial plants bloom year after year -- pick your favorite perennial flowers from these antique prints for your garden and landscape design. Perennials, when taken care of properly, can sometimes last decades in a garden. Flowering perennials will return year after year to add color and life to your garden. One can find a flowering perennial for every color of the rainbow. Papaver orientale. Oriental Poppy; P. alpinnm. Alpine Poppy; P. rabro-aurantiacum. Orange red Poppy; Meconopsis cambrica. Common Welsh Poppy; Argemone grandiflora. Large flowered Prickly Poppy; Sangoinaria caoadensis. Canadian Blood-root; Macleaya cordata. Cordate leaved Macleaya Adonis vernalis. Spring Adonis; Thalictrum aqnilegifolium. Feathery Columbine; Clematis integrifolia Entire. leaved Clematis; Hepatica triloba, Common Hepatica; H.americana. American Hepatica.